A push notification is a message sent to users who have downloaded your app and who have given you permission to message them. Push Notifications allow you to create and deliver branded, interactive content to your mobile audience. Because push notifications are permission-based they are the most mobile-friendly and effective marketing channel available today. 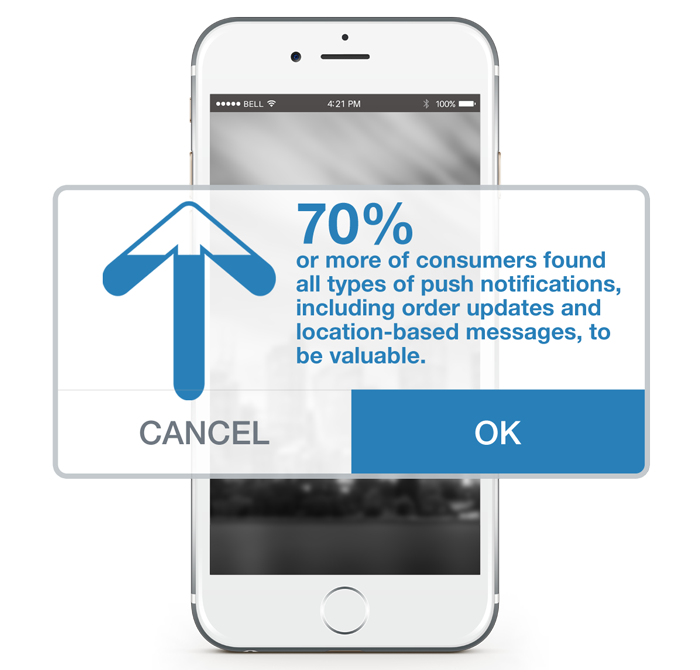 On average 70% of users will opt-in to receive push notifications. The open rate experienced with push notifications is a whopping 98%. A message can be created in minutes and received by the user within seconds after being sent. Messages will appear on the user’s home screen regardless of whether they are outside of your app, on a call or even if their screen is locked. Push notifications are more compelling than just text delivering images, adverts, coupons or even video. The messages can also be interactive driving customers back in store or to a specific place that you want them to visit within your app or website. Because of GPS integration, your app will be “location aware” so you can precisely target your customers with more personalised and relevant messages based on their current location. By creating a “virtual perimeter” within a map called a “geo-fence”, you can send an automated push notification to the user when they break the perimeter. Virtual perimeters can even be set up around a competitor’s location giving you the ability to virtually entice the user back to your business before they spend with your competition. When using the geo-fence technology, push notifications can also be scheduled to be sent out at a later date when the recipient is more likely to engage with the app. For example, a restaurant that is quiet could send out a message offering a dinner special to customers who are driving past between 5pm and 6pm that evening. Create a message that will expire at a certain time. After the message has expired it will cease to be sent out preventing inactive or out of date content.